At dusk we walked up a path along the stream that stitches together Pano Potamia and Kato Potamia, two villages in the most fertile part of Naxos, the Greek island. 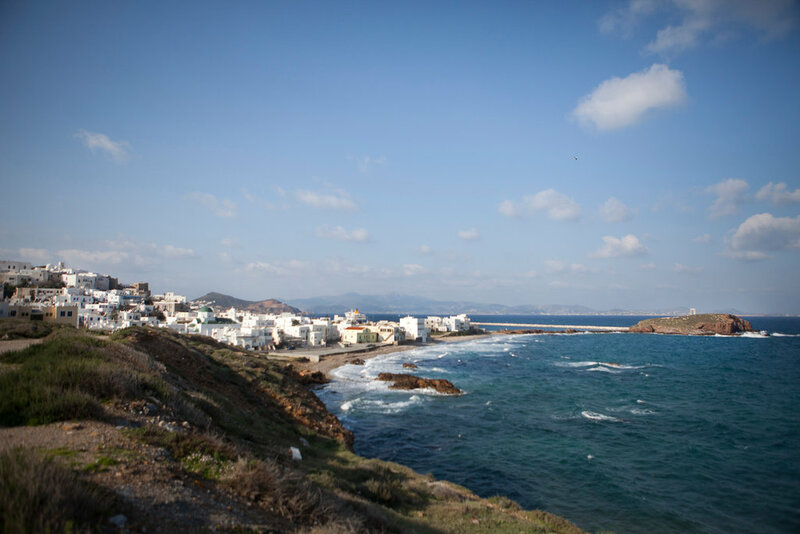 While most of the other Cycladic islands are as dry as toast, Naxos is covered in verdant valleys and mountain villages, clusters of whitewashed houses nestled into a Bruegel-like landscape. That evening last summer my husband, Pedro, had our baby strapped to his chest and the slippery stones and the impending darkness ignited a moment of panic as we headed toward Pano Potamia, the upper village, and the source of the stream. We passed river crabs and a knot of swans and then several ruins, including a crumbling tower where evidence of a 13th-century forbidden love affair is said to be buried. We were on our annual trip to Naxos, where my half-Greek husband’s mother, Voula, lives on a small farm. Arriving at the village, we found the church where my niece and nephew were baptized, and Pigi, the tavern where Voula gave our rehearsal dinner the night before our Jewish-Greek wedding, almost a decade before. She served goat on the spit and, following her own special logic, offered rooster for the vegetarians. 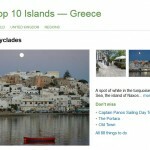 That was 2004, when Greece hosted the Olympics and there was a feeling of buoyancy on the island. In Athens there was even talk of the Elgin marbles coming safely home. 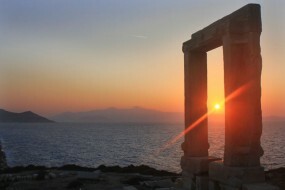 With each visit a layer of Naxos is peeled back for me. I learn of a new village, or that there is a ruin in the center of the island that I have never seen. I’m an American who does not speak Greek; while this makes me an outsider, I also have the foreigner’s thrill of learning facts that might elude tourists: that the village of Melanes is the best place for rooster in red sauce; that locals face the main street when sitting in cafes and not the picture-perfect port so that they can see who is walking — and with whom — through town. And despite my outsider status, I feel a tremendous closeness to the island, in large part because so many of my life’s milestones have taken place here. 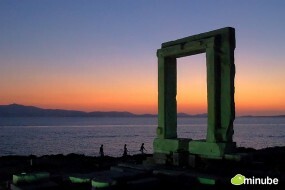 The first time I went to Naxos, well before that wedding trip, I was 23 and traveling alone. I’d gone to college with my future husband, who told me it was a “real” island — as opposed to those where tourism is mass-marketed, like Mykonos, with its urbane night life and high-end shops, or Santorini, which teemed with tourists attracted by its otherworldly landscape. 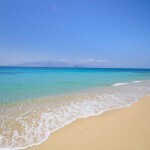 Naxos, he said, has the most beautiful beaches and secluded ruins. 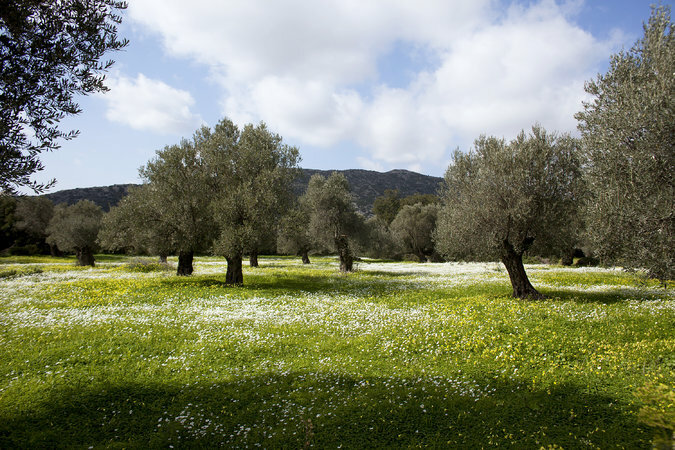 And because it has its own sustainable agriculture it is one of the few places in the Aegean where you can sit down to an entire meal of local produce. On that first trip, I went by the guidebook. I walked through the Castro, the old city that winds beneath a Venetian-era castle. I went to Plaka, a remote hippie beach where you could buy hemp bracelets. Greece was still on the drachma, the dollar was strong and everything was blissfully cheap. I ate baklava at a cafe at the harbor, and then I rented the requisite moped — and promptly crashed. 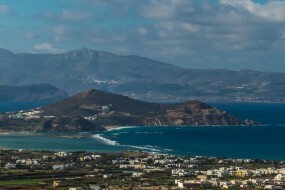 Once I married that boy from Naxos my appreciation for the island deepened. The first time he took me to the island he drove Voula and me up to Apiranthos, the highest village on the island, his old Volkswagen chugging around the switchbacks. At a restaurant there, we dined beneath a walnut tree. 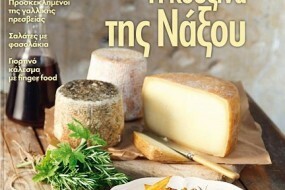 When I groaned with pleasure as I bit into tyropita, a layered savory pastry dripping with graviera, a melted hard cheese, Voula slapped my wrist. That spot is gone, and because of the global economic downturn that hit Greece particularly hard, so are many other restaurants and breweries. Anekamma, my favorite bakery, shut its doors. 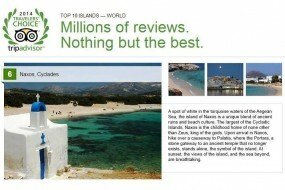 Despite being the height of tourist season, prices for everything from leather sandals to olive oil soap were reduced. There were “for sale” signs on properties throughout the island; as Naxians hold their land close, this was a serious indication of difficult times. But still bustling is Axiotissa, a restaurant near Kastraki beach where Voula, and most locals, go. Pink bougainvillea snakes along the vine-covered terrace and you can see past a garden of olive trees — along with chickens, goats and planted rosemary and oregano bushes — to the sea. Over many visits last summer, I found inventive dishes different from others I’d had on the island. We had salads topped with mizithra, a soft local cheese, and purslane, or with arugula and fresh herbs. Grilled eggplant was drizzled with honey and sprinkled with almonds, zucchini croquettes were flecked with fresh dill, and boiled rabbit was so tender it fell off the bone. Everything, of course, was local and organic. After lunch we passed by Voula’s portion of unused land along the beach to make sure no one was keeping goats there. Once it was the cool and fertile mountain areas farther inland that were coveted. Land by the beach was worthless; nothing could grow there. Now beachfront parcels are much sought-after — and yet half-built homes dot hills along the coast because the bank loans have ceased and no one can afford to finish them. From Kastraki we drove south to Alyko, a secluded beach surrounded by rocks, a cedar forest and dunes. Hovering on the lip of land above the water is a hotel, also half-finished, a ruin from a 1950s business deal gone sour. Yet it has left a pleasant legacy: It’s because of the hotel that a road was built to get access to these rugged, tucked away coves. 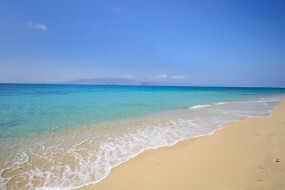 Also nearby is my favorite beach, Parthena, better suited to wind- and kite-surfing than to swimming. But on windless days — maybe three days a summer — the quarter-mile-long bay is perfect for a dip, and it feels wild and abandoned, as if we alone discovered it. I was married above Agios Prokopios, a dazzling stretch of white sand that extends down the west coast of the island, eventually becoming Plaka. It’s no longer the Plaka I first found 20 years ago; the hippies have moved on and now umbrellas and beach chairs take up real estate in front of the hotels and studios along the beach. 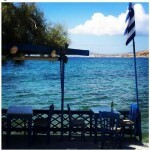 And while there are still quiet places to spread a towel, there is a wide range of tavernas in which to eat and drink. Last summer we went to a spot called Meze2 for calamari and sardines, but one can be happy eating marithes (tiny fried fish) and drinking a cold Mythos beer at any taverna along the beach road. Those inland areas, though, still hold a powerful appeal. According to Voula, everything good and healthy — honey, farm eggs, vissino cherries for preserves — comes from there. Last year we visited Halki, a village that was once the capital of the island because of its distance from pirate ships. From its main street there’s a short, paved walk, flanked by olive groves, to St. Georges, the Byzantine church. (A somewhat less pleasant stroll, I should add, if a stroller is involved.) Gianni’s Taverna in the center square is known for its gigantes, large white beans prepared in tomato sauce, as well as grilled lamb chops and souvlaki. The first time my husband took me there, the taverna was half-filled and the village was quiet. We had come from the nearby Church of Panagia Drosiani, Our Lady of Refreshment, one of the oldest Orthodox churches in the Balkans, which has rare Byzantine frescoes. It’s open to the public sporadically; that evening we ascended the steps, looking up to the rough stone bell tower, and an elderly woman greeted us in the small chapel. It was dusty and cool, and the faded frescoes were eerie and magical in the fading light. When we returned to Halki on this most recent visit — joined by my sister-in-law Patricia, her husband, Vangelis, their children, and a friend — the village teemed with busloads of tourists and Gianni’s was full. The famous Vallindras distillery was jammed with tourists waiting in line for kitron, a Naxian sweet liqueur made from the fruit of citron trees. The baby began to wail and I wanted to go back down to town for grilled octopus and an ouzo, made milky with ice. But Vangelis and his friend suggested another taverna in a village below, Damarionas, a place I had often passed but had never noticed. Locals would likely refer to our destination as the first place on the left when one enters the village, and that vagueness is indicative of the dining experience: The restaurant had no menu and so we were told what was available, which, as usual, I could not understand. My niece and nephew ran with other children — they stay out until 2 and 3 in the morning on Naxos, playing soccer and chasing village cats — along the brightly lit stone terrace. Along its side stood the oldest olive tree I’d seen, its trunk as thick as an oak. As we waited for our meal, the conversation turned, as it often does on the island, to local gossip. Pedro repeated a story about a restaurant in a particularly idyllic part of Plaka where, owing to a real-estate dispute, a beautiful tree had been burned with acid by a neighbor and left leafless. Finally the meal arrived: deep red tomato salads topped with feta, juicy souvlaki, heaps of fried Naxos potatoes — sweet and flavorful, deep yellow in color, they are famous all over Greece — and plates of the most tender boiled goat anyone at the table had ever tasted. A week later, we arrived at Pano Potamia, the baby asleep against Pedro’s chest. As we made our way to Pigi — I could already taste the tangy tzatziki, which we would soon slather on village bread — we passed a spigot at its entrance. Naxians say the water in Potamia is the clearest and purest on the island; Patricia had even brought a jug to carry water back to Voula. I knelt down at the spigot and cupped my hands. I once believed that island lore had it that to taste the water would make a wish come true; it turned out that wasn’t true. I sipped — the water was delicious — and made my wish anyway.